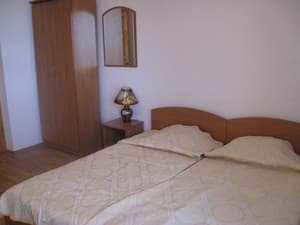 The hotel is located in Yalta, Livadia village, along the Vinogradnaya street. In 20-minute walk to the promenade in the primeval vegetation. In 10 minute walk there's Livadia Palace with a beautiful park, playgrounds, discos, open to the public. Within 5 minutes walk ther's a recreation center "Chernomorye". It is also located in the park with an open dance floor, sports facilities. Near the hotel there is an organ hall, with daily concerts. The hotel consists of main building and two cottages. The hotel has one, two-seat, 3-bed and 4-bed rooms. There is a courtyard with places to rest. 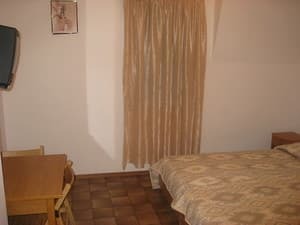 All rooms have TVs, refrigerators, modern new furniture, as well as in each room, shower and toilet. It is possible to organize excursions: excursions to Alupkinskiy Palace, Massandra Palace, Nikita Botanical Gardens, walking on the sea, visiting the tasting room of Massandra's vineyard, etc. TV (Cable TV), hot and cold water run all day round. On the attic floor there is an observation platform overlooking Yalta, Livadia and the sea, there are tables and chairs and sun loungers. Holidaymakers enjoy the beach of sanatorium "Black Sea", which is in a 5 minute walk from the hotel. There is about 800 meters from the hotel to the beach. The hotel is equipped with a separate room with all the necessary cooking equipment for vacationers. 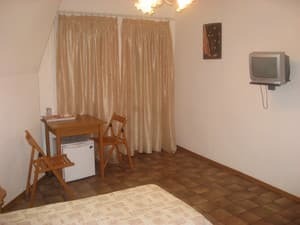 Description of the room: A double room with facilities shared for 2 rooms, a TV, a fridge, 2 beds, a wardrobe, 2 bedside tables, a desk, 2 chairs, the first floor, view of the courtyard. The room is 14 sq.m., with facilities zone of 3 sq.m. The hallway is 3 sq.m. Description of the room: A double suite with facilities shared for 2 rooms, a TV, a fridge, 2 beds, a wardrobe, 2 bedside tables, a table, 2 chairs, a balcony with outdoor furniture and an umbrella, the second floor, sea views. 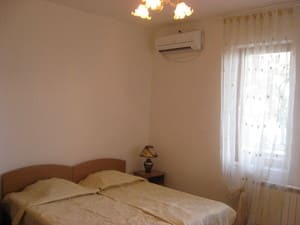 The room is 18 sq.m., with facilities zone of 3 sq.m. The hallway is 3 sq.m. The balcony is 4 sq.m. Description of the room: A double suite with private facilities included, a TV, a fridge, 2 beds, a wardrobe, 2 bedside tables, a table, 2 chairs, the suite leads to a balcony shared for 2 suites, with outdoor furniture, sea views, the first floor. The room is 12 sq.m., with facilities zone of 2.5 sq.m. The balcony is 11 sq.m. 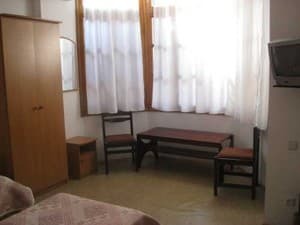 Description of the room: A double suite with private facilities included, a TV, a fridge, 2 beds, a wardrobe, 2 bedside tables, a table, 2 chairs, a view of the courtyard. 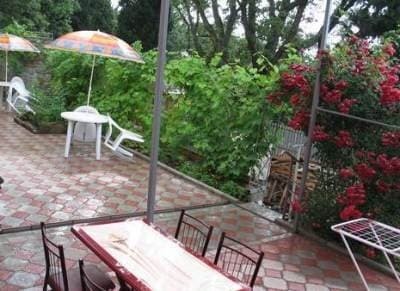 The room is 14 sq.m., with facilities zoneof 2 sq.m. 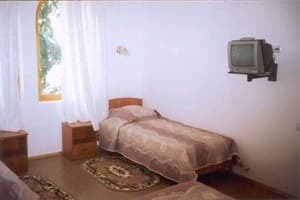 Description of the room: A double suite with private facilities included, air conditioning, a TV, a fridge, 2 beds, a wardrobe, 2 bedside tables, a table, 2 chairs, the room is 14 sq.m., with facilities zone of 3 sq.m. 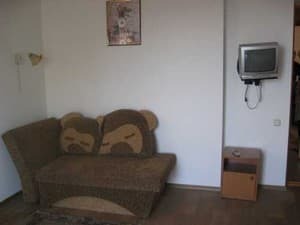 Description of the room: A double suite with private facilities included, a TV, a fridge, 2 beds, a wardrobe, 2 bedside tables, a table, 2 chairs, a sofa for a child under 12, the room is 18 sq.m., with facilities zone of 3 sq.m. Description of the room: A triple room with private facilities included, a TV, a fridge, 3 beds, a wardrobe, bedside tables, a table, 3 chairs, a view of the courtyard, the room is 16 sq.m., with facilities zone of 3 sq.m. Уютное место, достаточно комфортные номера, свой "летний дворик", приятная отзывчивая хозяка. Не понравилось отношение персонала: вроде бы все в рамках приличий, но видно, что отношение вполне формальное и мы не самые интересные для них клиениты. Навстречу не идут, выезд в 9 утра из гостинницы,невыспались страшно. Накануне попросили разбудить с утра,чтобы успеть к 9 собраться. Нам предложили разбудить нас в 9, уточнив хватит ли нам времени на сборы Т.е. выезд в 9, и будить в 9. Довольно странно. Сами проснулись - никто не будил. С утра попросили оставить вещи на ресепшене, так как был целый день до отъезда,нам объяснили, что лучше их сдать в Ялте на автовокзал.Вроде бы дейстивительно все верно, но за всем этим мне кажется стояло просто нежелание возиться с нами. По крайней мере мы так чувствовали, поэтому осадок от гостинницы остался в целом неприятный. К тому же, кто-то из гостей прожек столешницу кофеваркой и не признался, подозрение пало на нас, пришлось оправдываться - тоже было неприятно. С этого момента и почувствовалось какое-то напряжение в общении. В общем и целом место неплохое, но в Бахчисараее в Мерабе гораздо приятней в общении сами люди,гораздо более человечные, больше идут навстречу, что соответсвенно создает совершенно другую атмосферу: радушия и гостеприимства. В Ливадии мы этого совсем не почувствовали. Вряд ли еще туда поедем.Хотя хозяйка неплохая, но мы ее не видели (только по телефону общались). Children are settled from the age of 4 years, children after 12 years have an extra 50% discount on the price of an adult site. 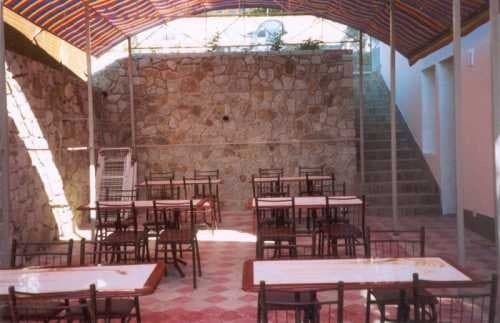 The hotel is located in Yalta, Livadia village, along the Vinogradnaya street. In a 20-minute walk to the promenade in the primeval vegetation. In a 10 minute walk there's Livadia Palace with a beautiful park, playgrounds, discos, open to the public. Within a 5 minute walk ther's a recreation center "Chernomorye". 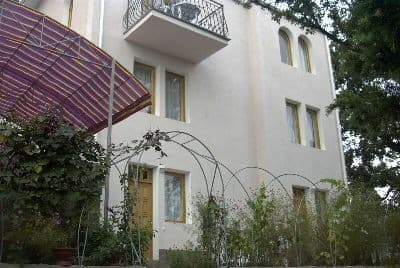 By train to the station in Simferopol, with taxi to the bus station in Yalta, bus number 5 or a shuttle bus number 11 to the stop "Tbilisi" restaurant, on a preliminary request a shuttle is offered.